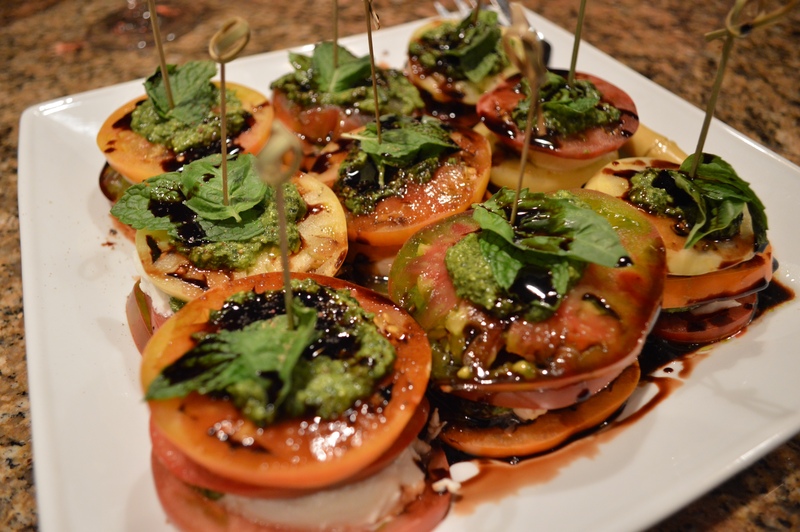 caprese salad with heirloom tomatoes/buffalo mozzarella/basil mint pesto & balsamic reduction | eat. cook. blog. About a month or so ago, Tony and I went to an Adventures by the Book event. Adventures by the Book is a really cool concept – the owner, Susan McBeth, says she “offers worldwide opportunities for readers to connect with authors on an intimate basis through unique, interesting and adventurous travels and events.” I’ve been to several of them and they are always so fun and it’s such a clever idea. I’ve been to a Ladies Literary Tea at the Westgate Hotel where I heard author Luisa Weiss talk about her memoir/cookbook/food blog. I’ve been to the San Diego Air & Space Museum where we joined author Jennifer Niven (Velva Jean Learns to Fly) for a behind-the-scenes docent tour of the museum (very cool!) and have made pie with Beth Howard, author of Making Piece and blog The World Needs More Pie. 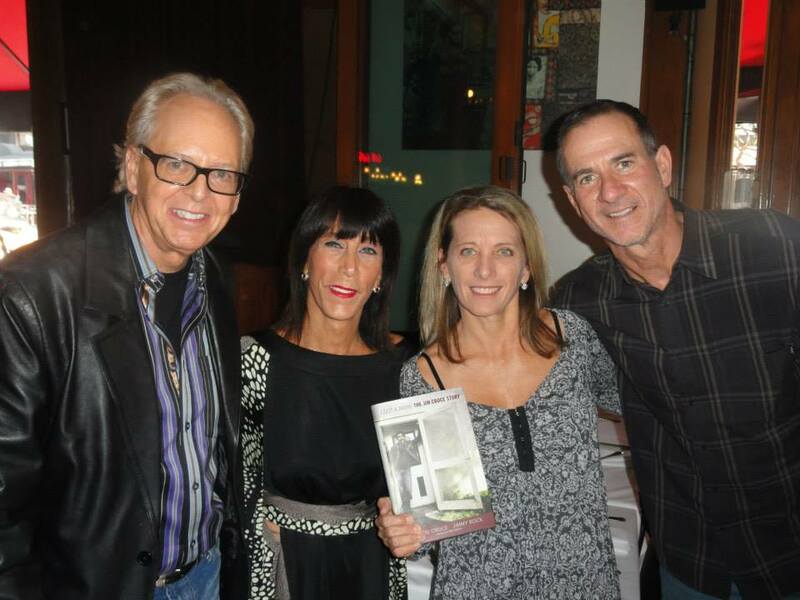 This particular “Adventure” was held at the iconic Croce’s Restaurant in downtown San Diego. Ingrid Croce entertained and endeared us with stories from I Got a Name: the Jim Croce Story, about her life with her late-husband, renowned musician Jim Croce and how the dream of Croce’s came to be after Jim was tragically killed in a plane crash. Ingrid signed copies of I Got a Name for all of us and also gave us copies of her cookbook Photographs and Memories: Recipes from Croce’s Restaurant & Jazz Bar. Of course, I thumbed through the cookbook on the way home and I came across the Caprese Salad with Heirloom Tomatoes, Buffalo Mozzarella, Basil-Mint Pesto & Balsamic Reduction, which I immediately decided I’d make for a dinner party we were having the following weekend. Well, the caprese was a hit. It’s gorgeous and it’s delicious. Everyone loved it. I bought beautiful heirloom tomatoes at our local farmer’s market. I made both the pesto and the balsamic reduction the day before. I really like the addition of the mint in the pesto. This is a keeper. Thanks Ingrid. Oh, and if you haven’t heard, Croce’s is closing their current location in the Gaslamp Quarter, with plans to open Croce’s Park West in the Banker’s Hill area of San Diego in mid-January 2014. Sad to see them leave that space (they’ve been there nearly 30 years and were one of the very first restaurants in the Gaslamp and led the way for the multitude of eateries there now), but excited to check out the new digs! Combine the vinegar and sugar in a small saucepan and bring to a boil. Reduce by one half, or until the liquid just starts to chicken. Remove from heat and let cool. Will keep refrigerated, up to one month. In a food processor, purée the basil, mint, garlic, pine nuts, cheese and lemon juice until the mixture has a paste-like consistency. With the processor running, add the oil in a slow, steady stream to emulsify. Season with salt and pepper. Will keep refrigerated, up to one week, or frozen for up to three months. On each salad plate, build a tower of alternating tomato slices, mozzarella slices and pesto. Repeat three times, topping with a slice of tomato. (I actually made smaller “towers” and served them all on one big serving plate.) Clean the bottom portion of the rosemary sprigs (if using) so that you can skewer the tomato towers with the sprigs. Drizzle the balsamic reduction and olive oil over the towers and around the plate, and garnish with basil and mint sprigs. Finish with sea salt and freshly ground pepper.